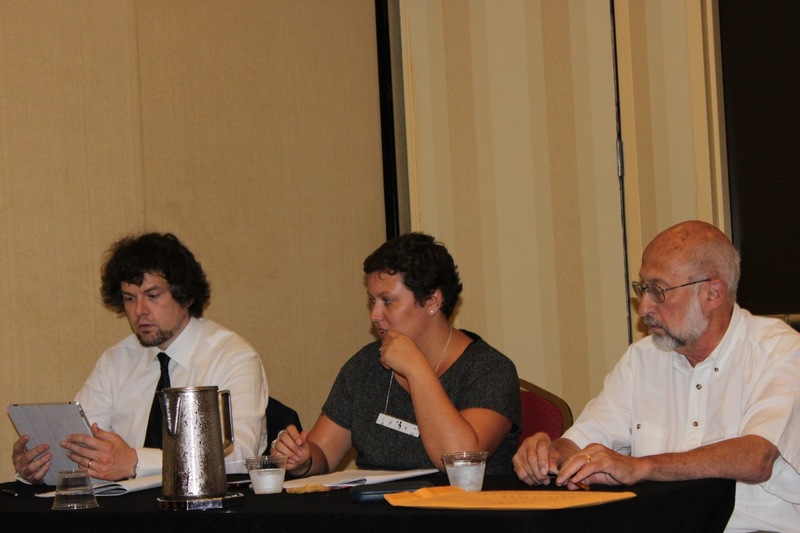 Reading my SFRA 2012 Conference paper from my iPad. With Jennifer Kelso Farrell and Donald M. Hassler. As a scholar, teacher, and writer, I want to better understand how culture works. I want to take it apart and put it back together. Like radios, cars, and personal computers, I want to uncover the linkages and understand how each part connects–acting on, being acted upon, interacting. It is my intention to critique and add to culture through my multifaceted writing and teaching. My work focuses on interdisciplinary questions and approaches to science, technology, and culture across the spectrum from literature to new media. Specifically, I wonder about the co-development of culture, including video games, social media, literature, and film, with the sciences and technologies that influence and make those forms of media possible. I consider it my objective to unravel those relationships, critique what those relationships might mean, and put forward new research and teaching approaches based on my findings. In my published work, I have considered issues around teaching critical theory to undergraduate students through discussions of science fiction, rethinking Blizzard’s World of Warcraft as a potentially cosmopolitan space, and debating fictional and military-industrial inventors of the modern tank. My specific interests in science fiction unite these major publications, but it is also science fictional themes across all media that bridge my interest to video games. The importance of games to contemporary culture combined with my life-long interest in games as compelling, interactive narratives has led to this cultural medium developing into a major component of my overall research interests. I deploy a variety of methodologies and theoretical frameworks in my research. I have training in twentieth-century American literature–particularly in the novel, African-American literature, postmodern theory, postcolonial theory, and queer theory. I consider theoretical frameworks to be useful to beginning and extending conversations, but the theories of others are not the end point of my research. It is my objective to develop my own theories and contribute to the overall conversations in the work that we do. 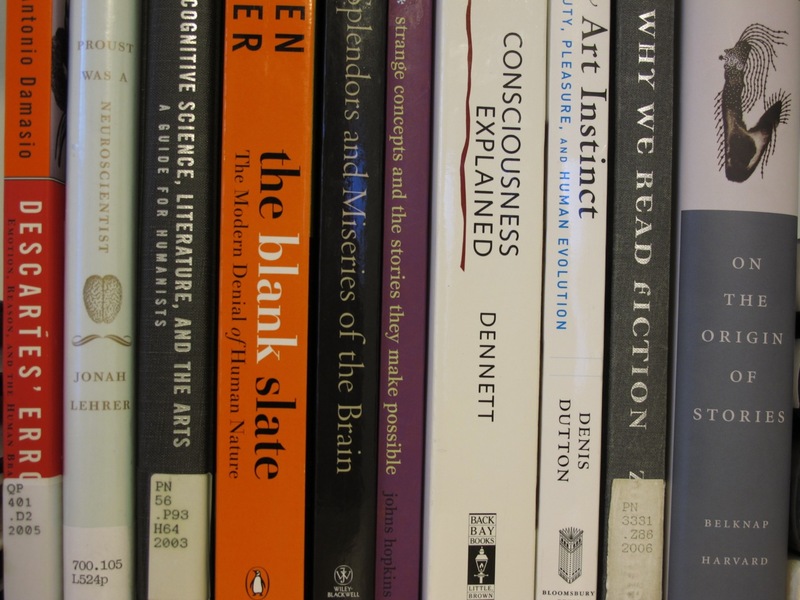 Toward this end, I am now developing two key chapters from my dissertation, “Brains, Minds, and Computers in Literary and Science Fiction Neuronarratives” into publishable articles and I am expanding the work as a whole into a book-length manuscript for publication. As in my other work, I am excited by developing interdisciplinary approaches to answer new questions. In the case of my dissertation, I bring together theories of the neurosciences, theories of human-technology co-evolution, and theories of science fiction to create a new science of mind: I argue that science fiction is an evolutionary byproduct of the human animal’s adaptation for narrative and our co-evolution with technology, or put another way, science fiction is a coping mechanism for the human animal’s lack of time to evolutionarily adapt to the rapid transformations made possible by science and technology. I also apply this theory to social media and video gaming, because I believe that these interactive elements of culture derive, even if indirectly, from shared science fiction concepts that go back to the genre’s emergence in the pages of Hugo Gernsback’s inaugural issue of Amazing Stories in April 1926. It is important to my work that I circulate my ideas and engage discourse in a variety of interrelated ways. First and foremost, I seek to publish my work as journal articles, book chapters, collaborative book projects, and self-authored books. Publication is the primary aim of my research work while conference presenting supports and supplements the publication process. Furthermore, the work that I do derives from and informs my teaching. In my role as an educator, I believe that it is important that I introduce students to fields of study through my specific expertise in those fields. I accomplish this often through research that I have published or plan to publish in the future. Additionally, as the standards of academic publishing evolve in response to new methods of online discourse, I want to contribute to these new discursive spaces. As part of learning how online publishing works, I acted as the layout editor of the refereed, open-access journal Pakistaniaat during its first two years of operation. I also take part in online discussions on professional email lists, Twitter, and Facebook. Online discussions provide incredibly democratic access to a greater number of invested individuals, many of whom are not in the academy. In addition to sharing some of my more theoretical ideas and arguments on my blog—dynamicsubspace.net, I also endeavor to share my work there to a wide audience of non-professionals. I believe that engaging professional and non-professional communities is a rewarding experience for my work, because it allows me to gain a better understanding of the stakes and stakeholders in a given text or issue. 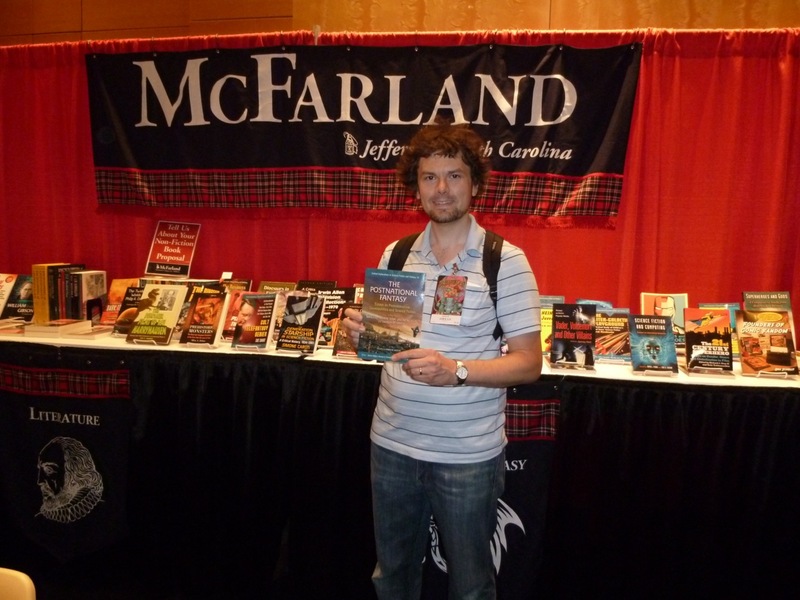 Standing in front of the McFarland booth at a con with my co-edited collection, The Postnational Fantasy. I believe that my research is important to professional and non-professional audiences, because I seek questions that will hopefully lead to a deeper understanding of contemporary culture and its relationships with science and technology. I have contributed longer essays to two book projects, one of which I co-edited, and the preeminent H.G. Wells journal, The Wellsian. Of the two books that I have contributed to, Practicting Science Fiction has received great reviews (“This slim volume will be of substantial value to teachers and scholars,” Bill Dynes in Extrapolation), and The Postnational Fantasy, the critical collection of essays that I co-edited with Masood Ashraf Raja and Swaralipi Nandi, has reviews forthcoming in Extrapolation, The Journal for the Fantastic in the Arts, and SFRA Review. I also believe that these collections are valuable additions to the field, because there have been a number of pulp and ebook sales combined with online discussion about both volumes. As an editor, it was an exciting experience working with authors to create a unified collection of essays that speak to one another while also speaking to the wider discourse. I have also contributed a number of reviews to science fiction and German culture journals, and two shorter essays to encyclopedic works, one of which is forthcoming from Ashgate.